Enzyme-mimicking (nanozyme)-based biosensors are attractive owing to their unique catalytic efficiency, multifunctionality, and tunable activity, but examples of oxidase-like nanozymes are quite rare. Herein, we demonstrated that histidine-capped gold nanoclusters (His@AuNCs) possessed intrinsic oxidase-like activity, which could directly oxidize 3,3′,5,5′-tetramethylbenzidine (TMB) to blue colored ox-TMB without H2O2. The assembly of reduced graphene oxide (RGO) with His@AuNCs could further improve its oxidase-like activity and the His@AuNCs/RGO nanocomposites had a lower Michaelis constant (Km) and higher catalytic constant (Kcat) for TMB oxidation. 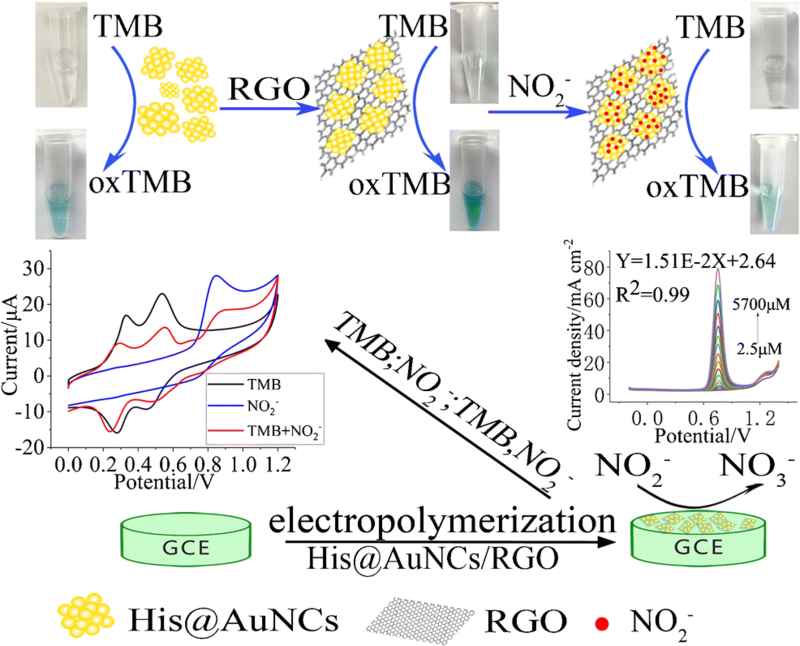 Furthermore, compared to other nanomaterials, the as-prepared His@AuNCs/RGO also exhibited enhanced electrocatalytic activity toward TMB. Interestingly, nitrite inhibited the catalytic (chromogenic) and electrocatalytic processes of His@AuNCs/RGO in the oxidation of TMB. The oxidase-like and electrocatalytic activity of His@AuNCs/RGO was evaluated with nitrite and TMB as substrates, and the results indicated that TMB and nitrite might share the same catalytic active sites. On the basis of these findings, a colorimetric and electrochemical sensor was developed with the His@AuNCs/RGO composite as an oxidase mimic for determination of nitrite with linear ranges of 10–500 μM and 2.5–5700 μM, respectively. The developed method was successfully applied to the detection of nitrites in real samples. 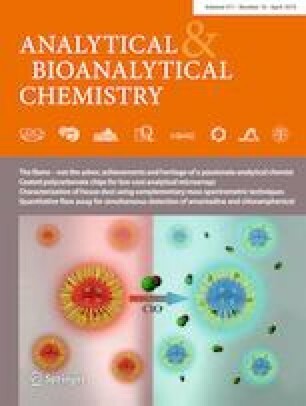 The present work suggests that the oxidase-like nanozyme is not only suitable for colorimetric assay but also for development of electrochemical sensors in bioanalysis. The colorimetric and electrochemical detection of nitrite using His@AuNCs/RGO. The online version of this article ( https://doi.org/10.1007/s00216-019-01655-y) contains supplementary material, which is available to authorized users. This work was supported by the National Natural Science Foundation of China (21565020). The manuscript was written through contributions of all authors. The authors declare that they have no competing interest. Bhattacharjee R, Tanaka S, Moriam S, Masud MK, Lin J, Alshehri SM, et al. Porous nanozymes: peroxidase-mimetic activity of mesoporous iron oxide for colorimetric and electrochemical detection of global DNA methylation. J Mater Chem B. 2018. https://doi.org/10.1039/C8TB01132J.